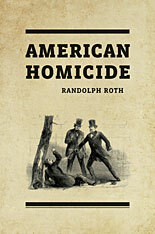 In American Homicide, Randolph Roth charts changes in the character and incidence of homicide in the U.S. from colonial times to the present. Roth argues that the United States is distinctive in its level of violence among unrelated adults—friends, acquaintances, and strangers. America was extraordinarily homicidal in the mid-seventeenth century, but it became relatively non-homicidal by the mid-eighteenth century, even in the slave South; and by the early nineteenth century, rates in the North and the mountain South were extremely low. But the homicide rate rose substantially among unrelated adults in the slave South after the American Revolution; and it skyrocketed across the United States from the late 1840s through the mid-1870s, while rates in most other Western nations held steady or fell. That surge—and all subsequent increases in the homicide rate—correlated closely with four distinct phenomena: political instability; a loss of government legitimacy; a loss of fellow-feeling among members of society caused by racial, religious, or political antagonism; and a loss of faith in the social hierarchy. Those four factors, Roth argues, best explain why homicide rates have gone up and down in the United States and in other Western nations over the past four centuries, and why the United States is today the most homicidal affluent nation.